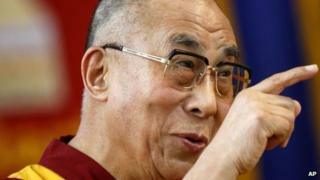 South Africa's government acted unlawfully in failing to give the Dalai Lama a visa in time for a planned visit last year, a court has ruled. Tibet's spiritual leader was forced to cancel plans to attend Archbishop Desmond Tutu's 80th birthday celebrations in October 2011. The Supreme Court of Appeal said the former home affairs minister had "unreasonably delayed her decision". The government denied it had bowed to pressure from China to block the trip. In response to the ruling, Archbishop Tutu's office said it as a "credit to South Africa's judicial system" and he looked forward to inviting the Dalai Lama to South Africa for his 90th birthday. The Supreme Court of Appeal was hearing an appeal application by two opposition parties - the Inkatha Freedom Party (IFP) and the Congress of the People (Cope) - about the issue. Earlier, the Western Cape High Court had dismissed the case, the South Africa Press Association reports. Archbishop Tutu was furious about the visa delay for his fellow Nobel Peace Prize winner and accused the government of behaving "worse than the apartheid government". According to the AFP news agency, the Supreme Court of Appeal found no evidence that the government had actually made a decision not to grant a visa, but did detect stalling tactics. "What is justified by the evidence is an inference that the matter was deliberately delayed so as to avoid a decision," the news agency quotes the judgment as saying. The court said that former Home Affairs Minister Nkosazana Dlamini-Zuma "was not entitled to deliberately procrastinate", South Africa's City Press newspaper reports. Ms Dlamini-Zuma, who is President Jacob Zuma's ex-wife, now heads the Africa Union. The Home Affairs Department said it respected the ruling of the Supreme Court, but would study the reasoning for the judgement before responding. China sees the India-based Nobel Peace laureate, who campaigns for the rights of the Tibetan people, as a dangerous separatist leader. It has pushed for his international isolation, urging governments not to meet him. The Dalai Lama visited South Africa in 1996, meeting then-President Nelson Mandela, but he was prevented from attending a peace conference for Nobel laureates in 2009 as the government said his visit would distract from preparations for the 2010 World Cup. IFP leader Mangosuthu Buthelezi said the judgement revealed the government had lost its "principles, moral direction and moral legitimacy" over the issue. "We are inviting the Dalai Lama to come to South Africa as soon as it is convenient to him, and we look forward to having him in our midst again to share with him the bond of peace, love and enlightenment," he said in a statement. Last year, the Dalai Lama eventually delivered a lecture at Archbishop Tutu's birthday celebrations via a video link. Tutu at 80: Will humble pie be eaten at his party? Have Your Say: Is China interfering in Africa's affairs?